Stagecoach Catering offers a variety of menus and services for in house and off premise events, we can also customize buffets, table ware, and meals to your requirements or themes. 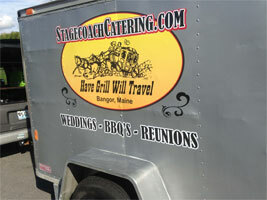 From BBQ's and lobster feeds, to lunch buffets or wedding receptions. In house liquor service available from the Elks, no off-premise liquor service available. Maine Professional Logging Association/ Safety BBQ. © 2019 Stagecoach Catering. All rights reserved.